Approximately 66 million years ago, a massive asteroid or comet smashed into the Earth near what we now think of as the Yucatan Peninsula of Mexico. On the other side of the world, in India, at a place called the Deccan Traps, a period of intense volcanic eruption began — one that would last tens of thousands of years. These catastrophic and powerful events are often considered the primary causes of the mass extinction event at the end of the Cretaceous period that wiped out most of the dinosaurs along with 75% of life on the globe. But new research reveals another factor that may have played a role in ending the era of the most massive creatures to ever walk the planet: It seems dinosaur eggs took a particularly long time to hatch. That means that when they had to compete for sparse resources in a post-extinction-event world with the more efficient amphibians, reptiles, birds, and mammals that made it through that era into the next one, dinosaurs may have lost out. Compared with reptiles, birds lay fewer eggs, and those eggs are particularly large. This could hamper their competitiveness since it exposes them to destructive risks. But bird eggs hatch about twice as fast as reptile eggs — their behavior keeps eggs warm and stable — and researchers think that helps enough survive to hatch. The mayor of a French town is getting a lot of attention after name a new road, which leads nowhere, “Rue du Brexit” in honour of Britian’s vote to leave the European Union. The announcement was quickly met with approval from the official Twitter account for the UK’s “Leave” campaign, which campaigned for UK residents to vote to leave the EU. “A fine choice,” the account tweeted, sharing Sanchez’s message. But it didn’t take long for social media users to point out that the road in question is a circular road that “leads to nowhere” – the street simply loops around in one big circle, with both entrances leading off of Rue Robert Schuman. To add to the irony, Rue Robert Schuman is named after a French politician who is considered one of the “founding fathers” of the European Union who served as the first President of the European Parliament and President of the European Movement. 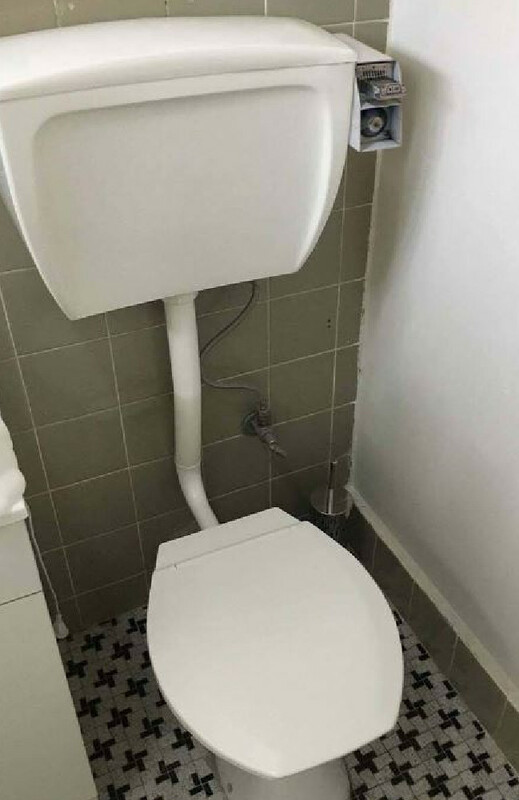 A MELBOURNE landlord has been blasted online after a tenant revealed he had installed a coin-operated toilet in the house, requiring the tenants to pay per flush. That’s right, the stingy landlord and owner of an apartment property in Thornbury has reportedly equipped the toilet with a mechanism that means residents have to pay $1 to flush the dunny. Unsure about the legality of such a contraption, the tenant posted the story on forum-based social media website reddit to ask the community if the landlord was allowed to do this. “I understand in our laundry having to pay for the communal washing machine. But I pay the water bill that goes into my apartment,” the tenant wrote. As you might expect, the tenant said it makes it very awkward to entertain guests. Fewer children visited emergency rooms for asthma problems in the three years after cities banned indoor smoking than in the three years before, according to a new study. PROVIDENCE, R.I. [Brown University] — A new study helps to answer the burning question of whether recently enacted indoor smoking bans in public areas have improved health. The research finds the bans are associated with a 17 percent overall reduction in the number of children visiting emergency departments with asthma complaints. Shireman and co-authors Dr. Christina Ciaccio of the University of Chicago and Tami Gurley-Calvez of the University of Kansas argue that more cities should pass restrictions that prevent smoking in indoor public spaces such as restaurants. The three researchers performed the study while colleagues at Kansas. WINSTON-SALEM, N.C. -- Police say a car went airborne before crashing through the roof of a home in Winston-Salem on Friday around 4 p.m. The accident happened at a group home for autistic adults in the 2900 block of Konnoak Drive. Emergency crews on scene say five or six people were inside the home with the car crashed through the roof. No of those people were hurt. Forsyth EMS says a woman who was driving the car was taken to Baptist Hospital. Investigators believe she had some sort of medical emergency and lost consciousness while driving. An inmate at the Douglas County Correctional Center was injured Tuesday evening when she hit her head while jumping for joy that she was going to be released, according to 911 dispatch reports. She was taken by ambulance to Creighton University Medical Center with an injury that was not life-threatening, according to the 911 reports. The incident happened about 7:10 p.m. at the corrections center at 710 S. 17th St. The woman apparently hit her head on a top bunk at the jail.